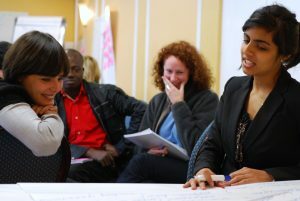 Building on INTRAC’s extensive experience in both monitoring and evaluating (M&E) and in advocacy, this course will support practitioners with how to ensure M&E is integrated into both planning advocacy initiatives and feeding into organisational learning and accountability. The course will focus on a variety of practical ways to meet the challenges of advocacy M&E. The course content draws on real-life case studies from our work in supporting organizations to develop advocacy strategies and from carrying out evaluations of advocacy initiatives. It deals with the challenge of how to assess contribution to change. Finally, it provides a series of practical tools which can help participants to develop and improve the advocacy M&E systems, in accordance with their organization’s capacity and needs. Very professional (brilliant) trainers. Loads of practical examples and sharing a lot of her experience. The cost of this course is £710 non-residential (includes training materials, 50-minute individual coaching session, lunch and refreshments) or £870 residential (includes training materials, 50-minute individual coaching session, meals and accommodation for duration of course).